HALO with its capabilities constitutes the ideal platform to address these questions. The aircraft is capable of carrying a payload up to altitudes of 15.5 km or θ = 420 K which is above the lowermost stratosphere (LMS) in mid latitudes (10 to 14 km). The region is particularly in the so-called overworld which is strongly affected by the Asian summer monsoon. The flight altitude is therefore ideal for profiling the LMS by infrared limb and lidar nadir observations in combination with drop sondes. The combination of in-situ and remote sensing instruments, which is currently only available for the HALO aircraft, will result in a consistent high resolution view of the LMS from the overworld to the tropopause with unprecedented detail and coverage. Currently, only HALO is capable of providing the long duration and the altitude coverage in combination with the unique payload. It allows to investigate the vertical temperature and trace gas structure in the extra-tropical UTLS and the interaction between thermodynamical and chemical processes, which are relevant for the global understanding of mixing processes in this region. Addressing the WISE objectives requires a unique set of 3D measurements of temperature and static stability (N2), various trace gases (e. g. water vapor, ozone, tracers), and cirrus clouds obtained from remote sensing instruments of unprecedented resolution and data coverage, in combination with high precision in-situ observations. The 3D measurement capabilities of the new GLORIA infrared limb imager play an important role for the quantification of dynamical structures (e.g. N2) and trace gas structures associated with cross-tropopause exchange. A unique combination of limb and nadir remote sensing instruments (IR limb imaging/ lidar / uv-vis) will be used for innovative studies of optically and vertically thin cirrus clouds in the UTLS region. High-precision in-situ observations provide detailed information on mixing processes and tracer structure with high spatial resolution, which is essential to perform tracer-tracer analyses (e.g. CO-O3 correlations). 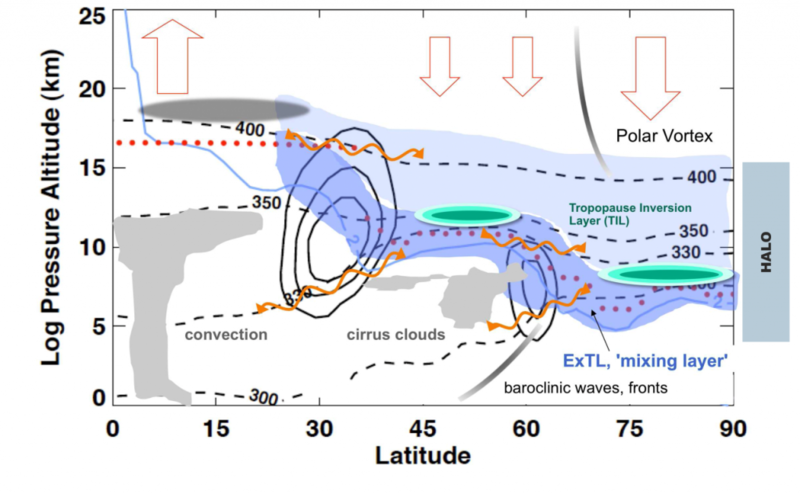 The evolution of baroclinic life cycles and Rossby wave breaking events and their role for cross tropopause exchange can be best observed over the Atlantic and North Sea. This includes the interaction of water vapor transport with the TIL and with the formation of SVC. An optimal campaign base would be Ireland with the opportunity of a stop on the Azores or Canary Islands. This would allow studying the temporal evolution of tracer structure and TIL on subsequent days during wave breaking events. The largest water vapor values in the UTLS occur during September/October. This is a result of wave-driven transport of water vapour, which is large from July until October in this altitude region. September/October is therefore the best period to investigate the impact of the Asian monsoon summer outflow on the composition of the LMS along with the effect of water vapor on the upper tropopause occurrence of cirrus and the feedback of the TIL and vice versa. Hoor, P., Wernli, H., Hegglin, M. I., and Bönisch, H.: Transport timescales and tracer properties in the extratropical UTLS, Atmos. Chem. Phys., 10, 7929-7944, doi:10.5194/acp-10-7929-2010, 2010. Jurkat, T., et al. (2014), A quantitative analysis of stratospheric HCl, HNO3, and O3 in the tropopause region near the subtropical jet, Geophys. Res. Lett., 41, 3315–3321, doi:10.1002/2013GL059159. Müller, S., Hoor, P., Berkes, F., Bozem, H., Klingebiel, M., Reutter, P., Smit, H. G. J., Wendisch, M., Spichtinger, P. and Borrmann, S. (2015), In situ detection of stratosphere-troposphere exchange of cirrus particles in the midlatitudes. Geophys. Res. Lett., 42: 949–955. doi: 10.1002/2014GL062556. Müller, S., Hoor, P., Bozem, H., Gute, E., Vogel, B., Zahn, A., Bönisch, H., Keber, T., Krämer, M., Rolf, C., Riese, M., Schlager, H., and Engel, A.: Impact of the Asian monsoon on the extratropical lower stratosphere: trace gas observations during TACTS over Europe 2012, Atmos. Chem. Phys., 16, 10573-10589, doi:10.5194/acp-16-10573-2016, 2016. Ploeger, F., P. Konopka, R. Müller, S. Fueglistaler, T. Schmidt, J. C. Manners, J.-U. Grooß, G. Günther, P. M. Forster, and M. Riese (2012), Horizontal transport affecting trace gas seasonality in the Tropical Tropopause Layer (TTL), J. Geophys. Res., 117, D09303, doi:10.1029/2011JD017267. Riese, M., et al. (2014), Gimballed Limb Observer for Radiance Imaging of the Atmosphere (GLORIA) scientific objectives, Atmos. Meas. Tech., 7, 1915-1928. Vogel, G. Günther, R. Müller, J.-U. Grooß, P. Hoor, M. Krämer, S. Müller, A. Zahn, and M. Riese (2014), Fast transport from Southeast Asia boundary layer sources to northern Europe: rapid uplift in typhoons and eastward eddy shedding of the Asian monsoon anticyclone, Atmos. Chem. Phys., 14, 12745-12762, doi:10.5194/acp-14-12745-2014, 2014.